This soup is sweet and tangy and, with the topping, crunchy and sour. All these flavors and textures roll around in your mouth and make you want to just keep eating it. Its color is gorgeous too. Danielle demoed this before a large audience at Brookside Gardens February 19, 2014. Melt the butter in a large pot and add the squash, ginger, garlic, cinnamon and saffron threads. Sauté over medium-high heat until squash browns, about 5 minutes, stirring often. Add the broth, tangerine juice, apricots and honey. Bring to a gentle boils, reduce heat and simmer until squash is tender, about 30 minutes. 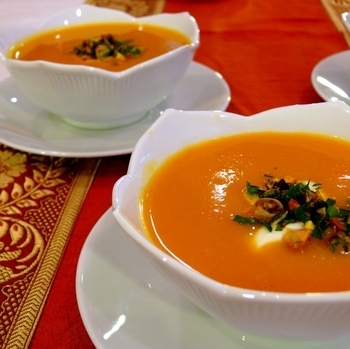 Let soup stand off the heat about 10 minutes, then puree in a blender or with an immersion blender, until smooth. Return the soup to the pot and heat until warmed through. Serve with yogurt and chopped pistachio mix. Serves 6. This entry was posted in Recipes from Danielle's pantry, Soups, Vegetarian and tagged apricot, apricots, butternut, garlic, ginger, orange, saffron, squash, tangerine, vegetarian. Bookmark the permalink.